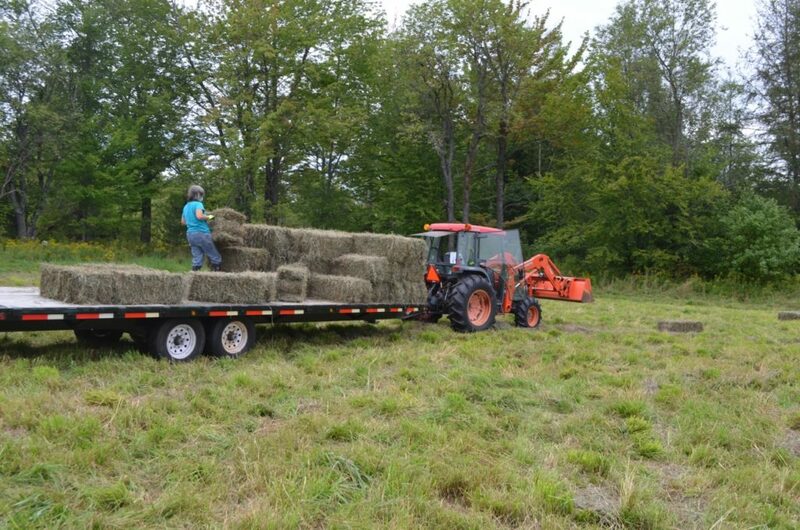 Well, that season … haying. Alayne and I finally had a chance to put up hay last week. 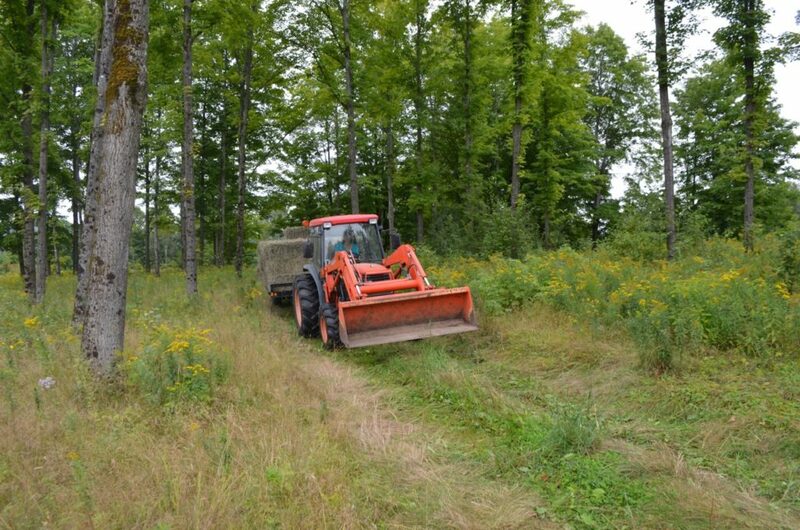 We didn’t have a decent window of weather at the beginning of the summer for the first cutting, so I had to just bush-hog it (mow it with a rotary cutter) in early July after the grass got too tall and rank, was falling over, and had gone to seed. We would have had a lot of bad hay, even if we’d had the weather to do it, which we didn’t. 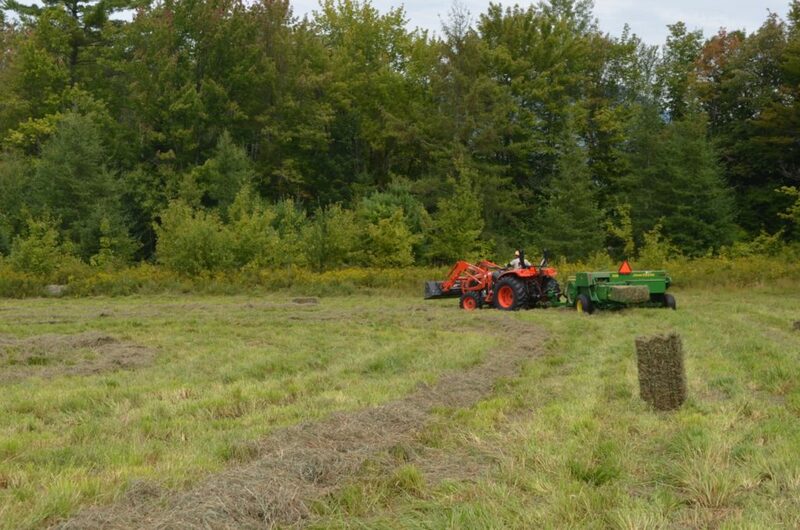 So I chopped it up, which is painful to do if you wanted it for hay, but is actually good for the hayfield because it puts nutrients back in the soil with the mulched grass. So that left us with a second cutting, which is the choicest hay in any case. You typically don’t get as much yield as you do with the first cutting, but it’s a higher quality hay and generally costs quite a bit more to buy. For the past few weeks we’d been anxiously watching the weather forecasts, waiting for the several days of clear weather we needed to get a nice crop in. In the photo above, Alayne is stacking the bales on the hay trailer while I continued to bale the rest of the field. You can tell those windrows aren’t very thick … but my oh my, what luscious hay we got this time! Our blind mare Lena and her two goat buddies will love eating this hay all winter! That’s Tanner in the foreground, and new arrival Daisy in the corner by the door. It’s funny how it looks like there are no other dogs in the house, but I had some behind me and next to me when I took the photo, and others were in the sun porch. Pretty soon they started migrating to the living room because of the warmth from the stove. Meanwhile, back in our former home in Montana, there’s a horrific wildfire that is threatening that community. The Rice Ridge fire exploded over the weekend by 48,000 acres in a single day, and is now at 101,000 acres as of yesterday (and grown since then, no doubt). It’s become one of the highest priority fires in the country. The area where our ranch was located, out on Kleinschmidt Flat at the base of Ovando Mountain, is now under an evacuation warning — not evacuated yet, but put on stand-by. You can read about it in this Missoulian story. Our thoughts are with our friends and former neighbors back there. Lots of hard work but your goats will be happy!! Praying for Montana & all affected by fires & hurricanes. Good to hear from y’all. What a fire season this year. I just looked at the map for the western half of the U.S. Unbelievable. We all need to think thoughts of rain and cooler weather. And pray that all of the folks in those areas stay safe and that our firefighters stay safe as well. I can only imagine what you are probably thinking… what if you were still in Montana and had to evacuate with all of the fur babies? What a stressful time that would be for you! Thinking safe thoughts for all of your friends and neighbors back in Montana. I don’t think I’ve ever heard hay referred to as “luscious” before. 🙂 Glad you were able to get the second cutting, after missing out on the first. 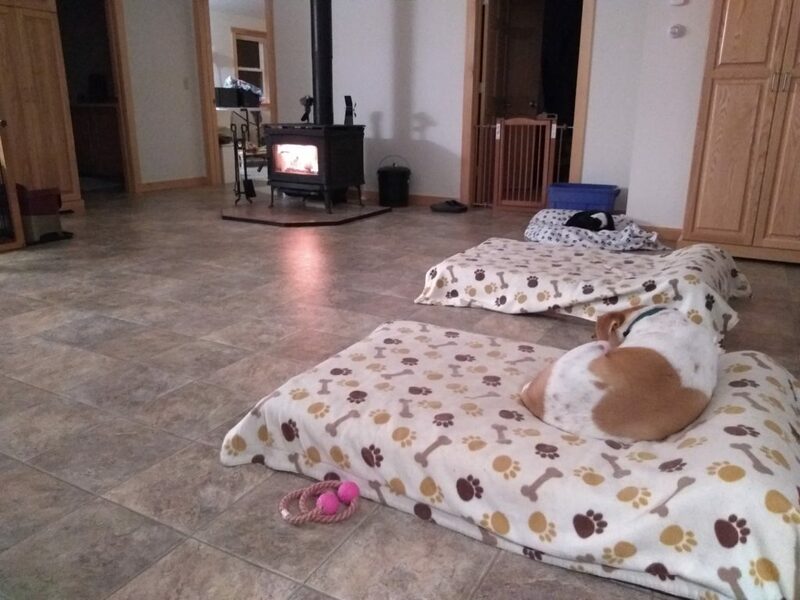 It looks so cozy in the room with the dog beds and the woodstove. A very happy place. Always love your updates. The fire in Montana and in your old neighborhood is beyond frightful and sad.